Shinobi of Akasaka, Inuyama Tadatomo. You wish to make my acquaintance? Alright, just make it worth my while. More dirty work for me? That's fine, I'll add it to the fee. Art of Flame Rebirth! Go on killing me over and over... I'll just keep coming back from the flames!! I got a good payout today. Farewell; your luck ran out when you met me. Monsters of all kinds haunt the Tokyo underground. This ninja is a member of an organization among them notorious for gathering intel: the Akasaka Agents. 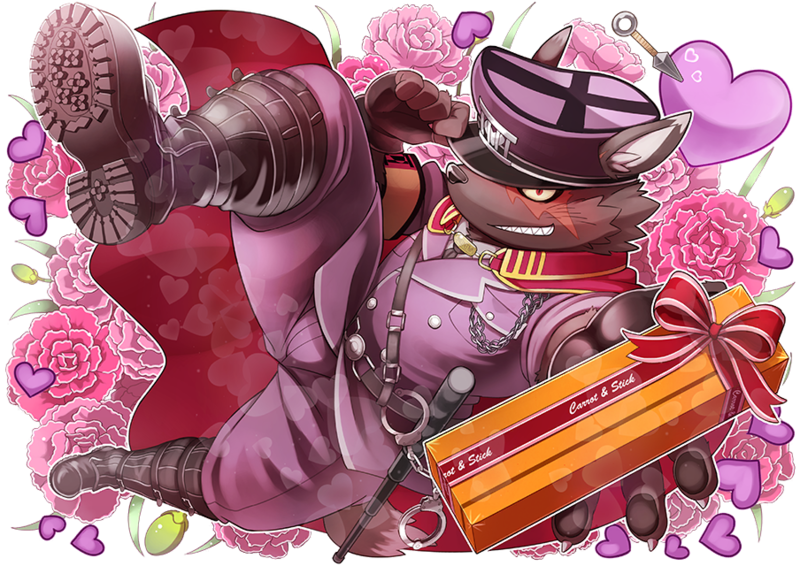 While they employ many talented non-combatants specializing in infiltration and capable of going undercover in various professions, Tadatomo serves exclusively as muscle. As long as the contract promises handsome rewards, no task is too unsavory for him. He is often mistaken to be ruthless and completely devoted to his missions, but the thing he values above all else is actually loyalty. In the underbelly of Tokyo where corruption runs rampant, this Summon works for the intelligence gathering guild known as the Akasaka Agents. The guild has many excellent agents ranging from non-combatant infiltrators to agile spies that take all kinds of jobs, but Tadatomo is a specialist a cut above the rest. If enough coins are on offer, there is no job he won't take. 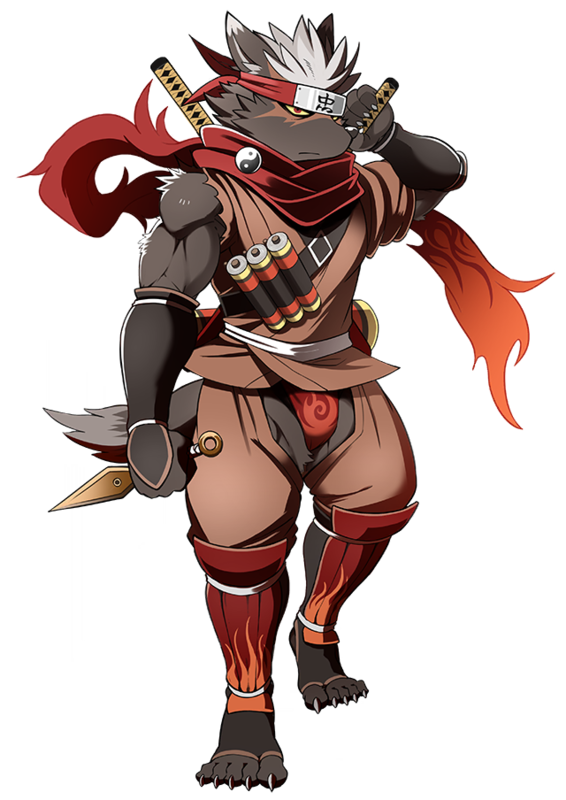 Tadatomo tends to be misunderstood as vicious and excessive in his zeal for the job, but he prefers the term "loyal." He has trained with the five elements of the ninja arts but is particularly adept with the fire element. The Scroll Sacred Artifact he holds has been passed down through generations of his ninja family. It burns with flames that will revive him like the phoenix, rising again to fight on. He swears allegiance to his lord and overzealously idolizes his late father who passed away when he was still young. He bases all of his decisions on what his father would have done and anyone who dares insult his father will meet a fate worse than death. He is surprisingly friendly toward loyal warriors who remind him of his father. 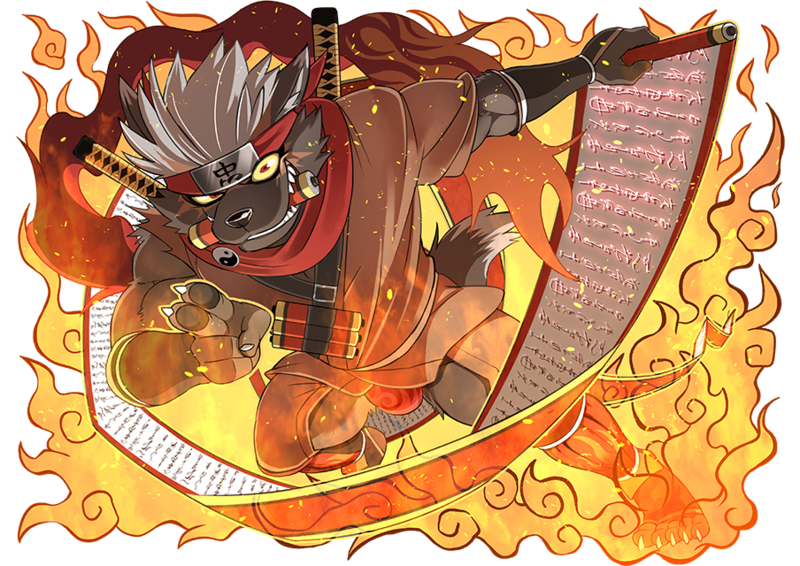 He wears various scrolls on his person, with fire-based ninpo being his specialty. The flame produced by his Sacred Artifact scroll has the properties of a phoenix's flame, with the power to revive him from death. He idolizes the father he lost at a young age, who was a samurai loyally sworn to his lord. He lives by the mantra "What would father do?" and those who dare to insult his father soon find out there are things worse than death. But he is surprisingly amicable to men who remind him of his father. Lone Wolf, Inuyama Tadatomo. My passionate loyalty...... Receive it, my new master! You'll regret it if you lay a hand on my master. Uchusuma's Raging Fire, Inuyama Tadatomo's devotion, I will demonstrate it! I'd love to be with you, master!! I will protect my master, with all my pride as Tadatomo. I will forever be loyal to you. A spirit orb transferred the memories of one of the eight samurai dogs to this ninja; a soul which happened to belong to the feudal lord he served under in the distant past. Regardless, he continues training as a ninja and works to accumulate Coin in order to achieve his prime goal of avenging his father. Although he appears to be a cold-blooded miser, he's actually very emotional. He devises intricate plans to achieve his goals but those plans are always full of holes. Furthermore, they often spiral out of control, landing him in danger, yet his Rule allows him to survive many dangerous situations. The spirit orb also contributes it's healing to his survival rate. A ninja Summon with the "memories" contained within a Hakkenshi spirit orb. What goes through his head is the memories the soul of his past life of the lord he served. But before he gets to that, he continues to strive for his mission to avenge his father he answered his summons for by doing ninja work and earning coins. He looks like a ruthless miser and a hothead and tends to run wild while scoffing at plans and running into problems. But because of his power he has a surprising ability at surviving tenaciously. Also, his spirit orb has the power to heal wounds, so his survivability powers up even further. is it just me or does the valentines tadatomo other skins are gone/inaccessible? Good news. The recent patch/update fixed his missing toes. When i checked out his full image, what happened to his foot?!!! This page was last edited on 4 March 2019, at 22:30.